The pedagogical foundations of INTELed stem from the theories of embodiment and their confluence with pedagogical theories of learning, that have resulted in the ideas of embodied learning. Embodied learning is a contemporary pedagogical theory of learning which emphasizes the use of the body in the educational practice. Put simply, the idea behind the pedagogical theory of embodied learning is that the body plays a significant role in shaping the mind. Embodied learning as a pedagogical approach is gaining momentum due to the appearance of innovative and affordable interactive technological interfaces that enable new forms of interaction between humans and computers. 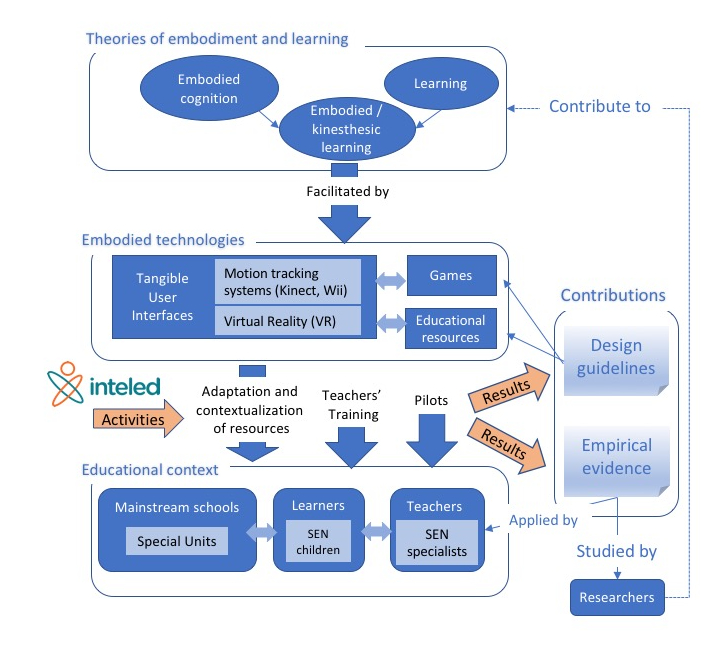 At the same time, embodied learning has been largely embraced in special and inclusive educational settings, given that the characteristics of technological embodied interfaces fit well with the needs of children in such as motor impairments, Autistic Syndrome Disorder, ADHD, and other mental disabilities. These characteristics have been taken into account by the consortium when designing the pedagogical activities and interventions during the project.